All Photos Credit: Daimler. Or McLaren and Daimler? Whatever. 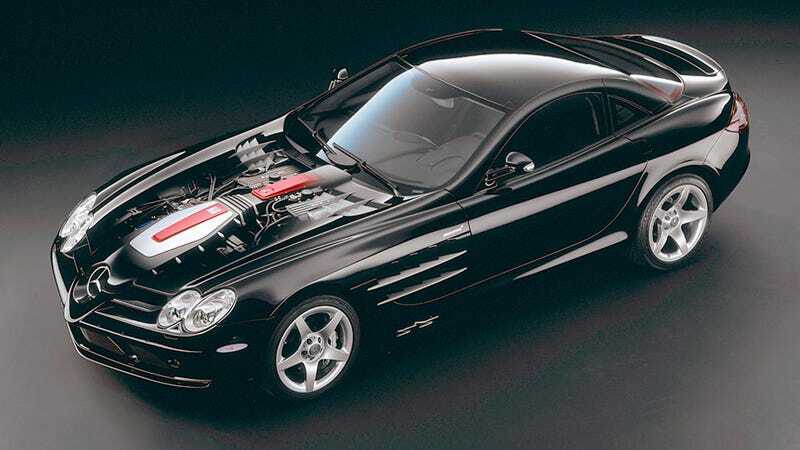 Please bear with me that I have a new and indefatigable obsession: the Mercedes-Benz SLR McLaren, the 207 mph Anglo-German super grand tourer, was available with 18-inch wheels. For some reason, Mercedes and McLaren elected to mostly shoot the press photos for the car on 18s from rather far away. Perhaps the two companies—working together to produce a halo car as part of the partnership that also gave the world Mercedes-powered McLaren Formula One cars— just wanted to give a lot of, er, atmosphere to these pictures. Actually, I’m underselling it: you had two different 18-inch wheels you could choose from for your SLR. A five-spoke and a 10-spoke design. As you can see, the specs were slightly different in terms of performance. The 18s were on narrower, taller tires. Less outright grip, I suppose, but that’s not always a bad thing. That and you’d get a better ride, in principle. Also, I love the notification to note use snow chains on these things. Thanks. The whole thing is a funny reminder that while this car was engineered and built by McLaren in the UK, there was still some Mercedes in its philosophy. That there was a “base” wheel package would only make sense for a company that sells C-Classes and E-Classes by the gazillion. And it’s also just a charming reminder of how far things have come in the last decade and a half. Cheap crossovers come with 18s, not supercharged carbon fiber rocketsleds meant for the richest of the rich. Please appreciate the camera car’s shadow left in this press pic. Now if only I could find out how much it cost to step up from 18s to 19s. I wonder what kind of ride-comfort enthusiast even chose to leave that box unchecked.